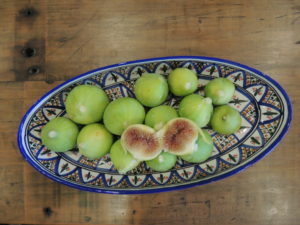 “Fig jam this year,” I thought last week, as I surveyed the figs developing on my fig tree. I have to admit that I’ve been quite proud of this three-year-old fig as I grew it from a cutting given to me by a friend, but I haven’t been able to identify it. This year it has more figs than ever before and they are ripening much earlier, I’m guessing due to the very hot dry weather we’ve been having. A few nights ago, when we were on the back verandah enjoying the coolness brought by a miniscule one ml of rain that arrived late in the evening, something quite large and heavy landed in the top of one of our silver birch trees. It soon set off again, leaving us to guess what it was. Trevor surmised that it was a flying fox, but I wasn’t so sure. Not so. More damage this morning, and the outermost figs eaten right through the netting. There wasn’t much more I could do, except secure the net more tightly and hope for the best. I picked some of the fruit, but then the insidious thought: what if the bats have contaminated the fruit somehow? A visit to NSW Health http://www.health.nsw.gov.au/environment/factsheets/Pages/flying-foxes.aspx provides the answer: as long as the skin is not broken, a thorough washing prior to consumption is all that is needed. Bats can carry diseases, but you are more likely to catch something if you are scratched or bitten, so they are creatures to be cautious around. I’m not planning to be around them, if I can help it. I lurked in the dark garden for quite some time to try to get a photo, but it was very difficult, and I don’t have enough patience to stay out there for hours. Rather surprisingly there were far fewer bats than the previous night. I managed to get one photo, but it isn’t clear enough to identify the flying fox correctly. The Environment NSWwebsite http://www.environment.nsw.gov.au/topics/animals-and-plants/native-animals/native-animal-facts/flying-foxes seems to indicate that the flying fox most usually found west of the Blue Mountains is the Little Red Flying Fox, although it didn’t look little to me. Fascinating though these creatures are, they are not welcome in my garden, but I have no say in the matter. I’m still hoping there will be enough figs to make jam! Oh dear, what a shame🙁 I have been hearing flying foxes in our garden in the evening too. Unwanted! Let’s hope they’re only visiting because they’re short of food at the moment due to the long dry spell we’re having. Flying foxes (bats to me) are gruesome, awful, scary creatures, to be avoided. How dare they come into your garden! Those figs must smell wonderful. Sorry about your loss, hope you can claim more than your share.. I agree, they’re not desirable visitors. I haven’t seen them before this summer. Do you think that the fig could be ‘Kadota’? I wondered that myself as the insides are quite pale. Another suggestion is white Adriatic, but they have raspberry jam coloured flesh, so I don’t think that’s what they are. I don’t think Kadota is a very common fig in Australia. Flying foxes have moved into our small regional city over the last 10 years. Not the small red kind, but big grey ones. Not even frosty mornings put them off. They eat everything in sight. My figs go in a flash. I think they might eat my tomatoes too, but it is possible that the culprit in that case is a rodent, but I wouldn’t put it past the flying fox. I suggest picking early and let your figs ripen off the tree. Our wildlife people tell us not to net because flying foxes can get caught up in them. Good luck. Thanks Tracy for your suggestion. Your bat problem sounds very bad. I’m hoping ours are only around because the weather has been so dry and there can’t be much out there for them to eat. Stinking fruit bats! someone should blow them up! We haven’t had any fruit in our (Lawson Street) garden because of these beggars. Not too sure how to stop them (legally). We have fruit bats flogging our fruit and fruit fly destroying our tomatoes (and eight lovely pears). When living in Bathurst, we had a Fig tree. Our biggest thieves there were possums. If anyone has any suggestions about ways to stop our garden being raided by pests, please let us know. Actually, the figs I’ve been able to salvage have been really delicious. Enough to eat, but not to make jam.